Each chapter meeting offers structured and informal networking opportunities. You may share your expertise by participating in chapter projects, promoting your services or exploring new career opportunities. Just once a month - take time for yourself. 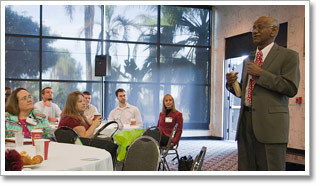 Get away from your office, join us at ATD San Diego and obtain the tools you need to take your work to the next level! Check out our Event Calendar to find out about our next meeting! Want to present at a chapter meeting? Check out our call for speakers page for more info.